According to U.S. Census Bureau, out of about 12 million single parent families in 2015, more than 80% were headed by single mothers. Today 1 in 4 children under the age of 18 — a total of about 17.4 million — are being raised without a father and nearly half (45%) live below the poverty line. If you are a single mom, these aren’t just statistics. You have the real life experience and challenge of raising kids on your own. Do you believe as a single mom, you can be a happy mom? 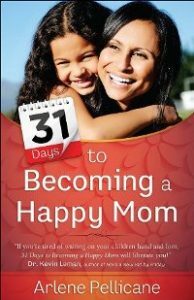 I hope so – and I believe the perspectives and truths in 31 Days to Becoming a Happy Mom can help. I interviewed my friend, author Laura Petherbridge who has been a single mom and who is known as The Smart Stepmom. There was a time when I was very bitter about marriage. It seemed to work out for everybody except me. I knew I had to do some damage control after that. The last thing you want to pass on to your children is bitterness. Never bash your ex in front of the kids. It’s easy to say, hard to do. You’ve got to look for great role models of marriage for your kids. Most single moms think “I have to spend all of my time with my kids. I have to dig in.” It’s going to seem counter intuitive but I say give yourself a break mom. Go have some fun with your friends. Be with other couples and have great experiences that you can tell your kids about. When I was a single mom, I got sick of being me. I didn’t like who I’d become. So I got involved in church which was tough as a single mom. I kept showing up and coming back. I found a tribe I could be honest with. I told them, “I don’t like who I’m becoming. Can you hold me accountable?” Good friends can do that for you and you can do it for them as well. To dig deeper, you can listen to this month’s podcast with Janet Thompson who raised her daughter as a single mom. Also Jennifer Maggio has excellent resources for the single parent. Don’t give up mom. Your best days are ahead of you. You are making an incredible impact on your home even on the days when you don’t feel like it. Keep filling your mind with God’s Word and what He says about you.